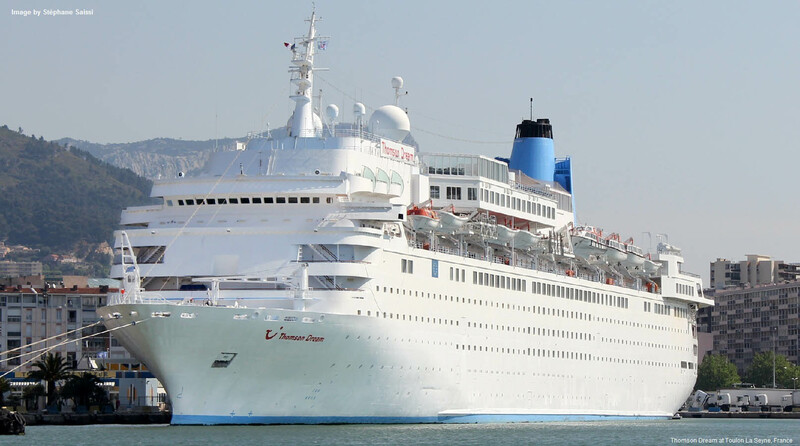 In the Cayman Islands on Monday, the Thomson Dream cruise ship, carrying more than 1,400 people, drifted dangerously close to the shore in the George Town harbor, due to strong current and strong winds. The ship was anchored but the captain called for tugboats to assist him as the stern swung dangerously close to the land and he was unable to control the vessel himself. He tried to use underwater thrusters to push the stern out but the wind speed increased and the thrusters did not achieve the task. Once the tugs arrived they towed the ship further out to sea, to a safe distance from the shore. Initial reports said that the ship had run aground but according to authorities, that was probably as the thrusters were stirring up the sand, and they confirmed that the vessel did not run aground. The passengers were quickly loaded on board whilst the tug boats held the ship steady, many observing from the upper decks as the tug tried to keep the Thomson Dream sufficiently stable for all to board before the ship set sail. This is not the first time there have been anchorage problems in the Cayman Islands. In August 2014, the 1,000 foot Carnival Magic cruise ship was guided by pilot boats to drop its anchor outside of the designated anchorage zone, due to the strong current. It eventually anchored in front of Don Foster’s Dive Centre in George Town, but in the process caused severe damage to the coral reef. The Department of Environment is still conducting an investigation in the incident and so far, no one has been held officially responsible.